Make sure absolutely no objects are obstructing the pedals' range of movement. Keep the driver's footwell clear of all obstacles. If there are any floormats or carpets in the footwell, make sure the pedals still have sufficient clearance. During sudden driving or braking maneuvers the objects could get caught between the pedals. You could then no longer brake or accelerate. This could lead to accidents and injury. As soon as the ignition is switched on, all the indicator lamps in the instrument cluster light up. If an indicator lamp does not go out after the engine is started or if it lights up while the vehicle is in motion, see. - Remove the SmartKey when the engine is switched off. - Check the starter battery and recharge it if necessary. The Start/Stop button must be inserted in the ignition lock and the KEYLESS-GO key must be in the vehicle. Pressing the Start/Stop button several times in succession corresponds to the different SmartKey positions in the ignition lock. This is only the case if you are not depressing the brake pedal. You do not have to remove the Start/Stop button from the ignition lock when you leave the vehicle. However, you should always take the SmartKey with you when leaving the vehicle. The vehicle can be started with the Start/Stop button and the electrical equipment can be operated while the SmartKey is in the vehicle. - Insert Start/Stop button 1 into ignition lock 2. When you insert Start/Stop button 1 into ignition lock 2, the system requires a detection time of approximately two seconds before you can use Start/Stop button 1. - Position 0: if Start/Stop button 1 has not yet been pressed, this corresponds to the SmartKey being removed from the ignition. - Position 1: press Start/Stop button 1 once. You can now activate the windshield wipers, for example. If you press Start/Stop button 1 twice when in this position, the power supply is deactivated again. - Position 2 (ignition): press Start/Stop button 1 twice. If you press Start/Stop button 1 once when in this position and the driver's door is open, the power supply is deactivated again. Vehicles with a gasoline engine: the catalytic converter preheats for up to 30 seconds after a cold start. During this time, the engine sound may be different. The transmission position display in the multifunction display shows P.
- To start a gasoline engine: turn the SmartKey to position 3 in the ignition lock and release it as soon as the engine is running. - To start a diesel engine: turn the SmartKey to position 2 in the ignition lock. goes out, turn the SmartKey to position 3 and release it as soon as the engine is running. You can also use the touch-start function. To do this, turn the SmartKey to position 3 and release it immediately. The engine then starts automatically. As long as the SmartKey is in your vehicle, the vehicle can be started. Therefore, never leave children unattended in the vehicle, as they could otherwise accidentally start the engine. When leaving the vehicle, always take the SmartKey with you and lock the vehicle. Do not leave children unattended in the vehicle, or with access to an unlocked vehicle. A child's unsupervised access to a vehicle could result in an accident and/or serious personal injury. The Start/Stop button can be used to start the vehicle without inserting the SmartKey into the ignition lock. 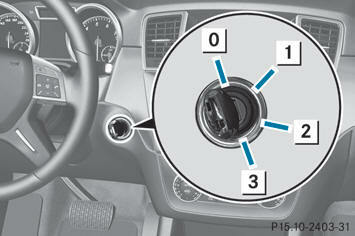 The Start/ Stop button must be inserted into the ignition lock and the SmartKey must be in the vehicle. - To start a gasoline engine: press the Start/Stop button once. - To start a diesel engine: press the Start/Stop button once. - Carefully depress the accelerator pedal. You can also deactivate the automatic locking feature. - Press and hold handle 1.
only) indicator lamp in the instrument cluster remains lit. - Depress the accelerator pedal. - As soon as the vehicle/trailer combination is held by the driving force of the engine, release lever 1. This gives you enough time to move your foot from the brake pedal to the accelerator pedal and depress it before the vehicle begins to roll. Never leave the vehicle when it is held by hill start assist. After approximately one second, hill start assist will no longer brake your vehicle and it could roll away. - Take your foot off the brake pedal. Hill start assist will not function if: - you are pulling away on a level road or a downhill gradient. - the transmission is in position N.
- the electric parking brake is applied. The engine does not start. The starter motor can be heard. - There is a malfunction in the engine electronics. - There is a malfunction in the fuel supply. - Try to start the engine again. Avoid excessively long and frequent attempts to start the engine as these will drain the battery. If the engine does not start after several attempts: - Consult a qualified specialist workshop, e.g. an authorized Mercedes-Benz Center. The engine does not start. You cannot hear the starter motor. The on-board voltage is too low because the battery is too weak or discharged. If the engine does not start despite attempts to jump-start it: - Consult a qualified specialist workshop, e.g. an authorized Mercedes-Benz Center. The starter motor was exposed to a thermal load that was too high. - Allow the starter motor to cool down for approximately two minutes. - Try to start the engine again. If the engine still does not start: - Consult a qualified specialist workshop, e.g. an authorized Mercedes-Benz Center. The engine is not running smoothly and is misfiring. There is a malfunction in the engine electronics or a mechanical component of the engine management system. - Only depress the accelerator pedal slightly. - Have the cause rectified immediately at a qualified specialist workshop, e.g. an authorized Mercedes-Benz Center. Otherwise, non-combusted fuel may get into the catalytic converter and damage it. The coolant temperature gauge shows a value above 248 °F (120 °C). The coolant level is too low. The coolant is too hot and the engine is no longer being cooled sufficiently. - Stop as soon as possible and allow the engine and the coolant to cool down. - Check the coolant level. Observe the warning notes as you do so and add coolant if necessary.